Ralph Romshek, 84, of Bellwood, died Monday, January 16, 2017, at david place in David City. Mass of Christian Burial Monday January 23, 2017 10:00 A.M.
Ralph L. Romshek was born February 7, 1932 in Bellwood, NE to Joseph M. and Ruth (Day) Romshek. He attended District 76 and Bellwood High School, graduating in 1949. He worked for Fredrickson Construction Company of Columbus, building steel Quonsets for the government to hold corn at various towns around the state. On August 13, 1953 he was united in marriage to Betty Tillman at St. Peters Church in Bellwood by Rev. G.C. Messman and two sons were born to this marriage. They lived in Columbus where he worked for Gerhold paving crew until being drafted into the army where he spent 19 months in Japan. After an honorable discharge in December 1955 he began farming, raising hogs and cattle and did commercial trucking of livestock and grain until he retired. He was a member of the Bellwood Volunteer Fire Dept. for 30 years, president of the Rural Fire Board and member of Bellwood Legion Post 327. 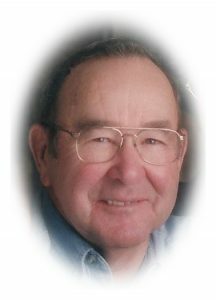 He enjoyed bowling, playing cards with Columbus friends, fishing in the Platte River along his farm and Nebraska football and basketball which he attended until his health failed. He also enjoyed the K.C. Royals and coached midget baseball in Bellwood for several years. Ralph is survived by his wife Betty, sons Doug (friend Crystal) and Dan Romshek, all of Bellwood, grandsons Dusty (Brittani) Romshek, and great granddaughter Neleigh Romshek of Columbus, sister Josephine Feaster of Lincoln, brother Jack (Betty) Romshek of Bellwood, sisters-in-law Mary Pat Romshek of Bellwood and Christina Tillman of Ashland, brothers-in law Roy From of Bellwood and Ron (Peg) Sherman of Rising City, nieces and nephews.